In 2010 when Gabby was 12 she developed a wart on the left side of her muzzle. It was harmless, but unsightly and I wanted to have it removed before it got bigger. I took her to my local veterinarian and they said the only way to remove it was surgery with general anesthesia. The cost would be about $450. I didn’t care about the money, however anesthesia is another story. I was told the risk of losing her to anesthesia complications was 1 in 400, and that was not acceptable to me. I had held off having a dental done due to the anesthesia risk, and instead had been using dental sprays and pulse antibiotics to try and keep her mouth clean. I knew several people who had lost young dogs to anesthesia during neutering or dental procedures. I had even read that Adam Sandler lost his beloved dog Meatball to anesthesia during a routine procedure. If it could happen to them, it could happen to us too. I considered anesthesia a “no other alternative” option, though everything has been fine when I had her spayed. I read about veterinary cryosurgery somewhere and decided to investigate further. Cryosurgery is a procedure where skin lesions are frozen off with liquid nitrogen or nitrous oxide. There was no anesthesia involved and no real risk to the dog, just a bit of pain when the freezing actually took place and certainly less painful and traumatizing than any surgery. The problem was, none of the veterinary clinics near my home seemed to offer it. After an unsuccessful search in Pittsburgh, I pulled out a map and started drawing circles, using the Internet to search for veterinary clinics in nearby cities. My search was successful when my expanding circles hit the Cleveland area. 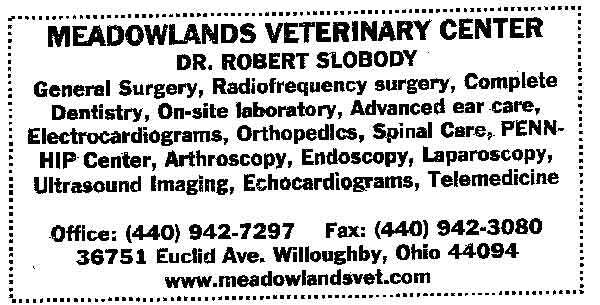 I located a veterinary hospital called Meadowlands Veterinary Center in Willoughby, Ohio, run by a Dr. Robert Slobody. I called and discussed the procedure with the receptionist, Mallory, who was very knowledgeable. I set an appointment and left for Willoughby at 6 AM a week later. The drive was about 142 miles and I got there shortly before our 9 AM appointment. A Sound Advice reader once sent me a question asking for a camera that was “small but mighty.” As I sat in the waiting room at Meadowlands, I realized that was what I had found… small but mighty. I had read a little bit on their website about the center’s technological capabilities, but I had not paid much attention to what they offered other than cryosurgery. Once I was there there was a video display highlighting things I had never heard about, such as minimally-invasive spays using a camera, a high-tech dental suite for teeth cleaning, cryosurgery, endoscopy, radiosurgery, laser therapy, and a few other things I don’t remember. I also saw they had an in-house lab that provided results from the bloodwork within minutes. At my local veterinarian, they drew blood and I did not get the results till the next day. We went in the examination room and met Dr. Slobody, who goes by “Doc.” He examined her free of charge when we were there. 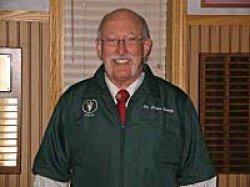 I could tell by the way he carried himself and the way he evaluated Gabby that he really was a cut above any veterinarian I had ever met. When he checked her motor function and her legs he manipulated her and tested her in ways I had never seen before. He then used an optical probe with a video screen to look in her ears, that was a first! He cleaned her ears for us before he got to the cryosurgery. He pulled out his cryosurgery kit and sprayed the wart three times. Gabby had some discomfort the first two times, but by the third time she hardly noticed. Doc told us the wart would fall off in about two weeks, which it did. We got our first time visitor discount so everything only cost $65. Full price would have been $99. That’s so much better than $450, combined with anesthesia risk. I left very satisfied with the experience, and happy and proud that I found a way to remove the wart without putting Gabby’s life at risk. I didn’t think I would ever need to go back to Meadowlands again for anything other than cryosurgery, given I was happy with my local veterinarian and this was the first time that my desires/requirements exceeded their technological capabilities. I knew I would always have Meadowlands as an option if I thought I needed something special. Little did I know then how important Dr. Slobody and Meadowlands would turn out to be, and what an essential part they would play in Gabby’s life in the years to come. As you will read later, Dr. Slobody and his staff and spared Gabby a lot of pain and probably extended her lifetime when we had a serious emergency not much later.